Designed for Mabel and Charles Ennis in 1923 and completed in 1925, the Ennis House was Frank Lloyd Wright's last Los Angeles-area textile block-style project and the largest. Ennis lived in the house for only a few years before he died. His widow sold it in 1936. After passing through five owners, it was purchased by Augustus Oliver Brown, who lived in it for many years, opened it for tours, and donated it for public use. For a time, it was called the Ennis-Brown House in his honor. In a 1979 issue of Architectural Digest, American architect Thomas Heinz writes, "Wright transforms cold industrial concrete to a warm decorative material used as a frame for interior features like windows and fireplaces as well as columns." The Ennis House is large at 6,200 square feet. It consists of the main house and a separate chauffeur's quarters, made from more than 27,000 concrete blocks; all made by hand using decomposed granite taken from the site. Sited on a hillside overlooking the city of Los Angeles, it commands attention even from the street below it. Although, this location has caused the house much trouble. The 1994 Northridge earthquake and the heavy rainfalls in 2005 severely damaged its underpinnings. 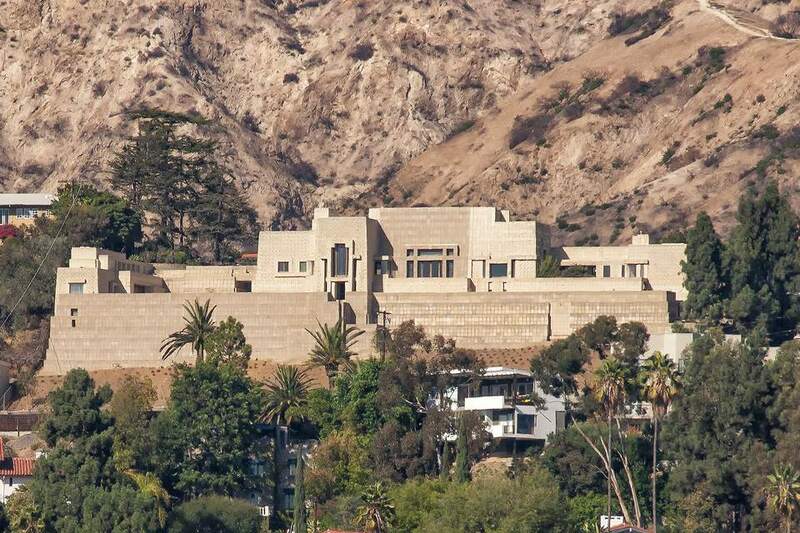 A retaining wall collapsed, and since then, the Ennis House remains closed to the public. For a time, its continued existence was in doubt, but as of mid-2001, it was purchased again. The owner says he is committed to its restoration and has agreed to open it to the public for a minimum of 12 days per year. The best way to get a clear view of the Ennis House is from the grounds of the Hollyhock House, although you will need binoculars to get a good look. The Ennis House's eye-catching presence has not been lost on the Hollywood film industry. It has starred in many movies. It may be best known as the place where Rick Deckard (Harrison Ford) lived in the 1982 film "Blade Runner," but it has also appeared in countless films, television shows, commercials, and photo shoots. Although used as a shooting location as early as 1933 in "Female," the house first acquired morbid fame as the exterior facade for the 1959 movie, "House on Haunted Hill." Other films it was featured in include "The Karate Kid Part III" revealing the view of downtown Los Angeles, "Black Rain," "The Glimmer Man," "The Replacement Killers," "Rush Hour" substituting for a floor of a Hong Kong skyscraper, and "The Thirteenth Floor." In television, it might be remembered as "the mansion" occupied by Angel, Spike, and Drusilla in the "Buffy the Vampire Slayer " series. David Lynch also used the interiors of Ennis House for a few segments of the show "Twin Peaks" for the soap opera show-within-a-show episode called "Invitation to Love." Because the house is situated in a densely populated neighborhood, tensions crop up when there are film production crews as well as streams of tourists and restoration construction workers. A film documenting the house, "The Ennis House," tells about its construction, gives a grand tour of the house, and discusses the damage stemming from the 1994 earthquake and the subsequent restoration and repair prior to the sale of the house to its current private owner. An early cut of the film premiered at the Frank Lloyd Wright Conservancy Conference in Chicago in 2007. It is available on DVD in both 2D and 3D versions. The Ennis House is one of nine Frank Lloyd Wright-designed structures in the LA area. It is also one of Wright's designs which are on the National Register of Historic Places. Others include the Anderton Court Shops, Hollyhock House, Samuel Freeman House, Hanna House, Marin Civic Center, the Millard House, and the Storer House. Wright designed only four California structures like the Ennis House using intricately patterned concrete "textile blocks." All the other textile block-style homes are in southern California. They are the Storer House, the Millard House (La Miniatura), and the Samuel Freeman House. Wright's work isn't only in the Los Angeles area, he built all over California. The San Francisco area is home to eight of his constructions and two of his most important works. You'll also find several houses, a church, and a medical clinic in some of the most unexpected places. Don't be confused if you find more "Wright" sites in the LA area. Lloyd Wright (son of the famous Frank) has an impressive construction portfolio that includes the Wayfarers Chapel in Palos Verdes, the John Sowden House, and the original bandshell for the Hollywood Bowl. If you're an architecture lover, there are a bunch of famous Los Angeles houses that are open to the public, including Richard Neutra's VDL house, the Eames house (home of designers Charles and Ray Eames), and Pierre Koenig's Stahl House.